The giant snake was shot and killed and is now in the hands of an exotic fashion store owner. 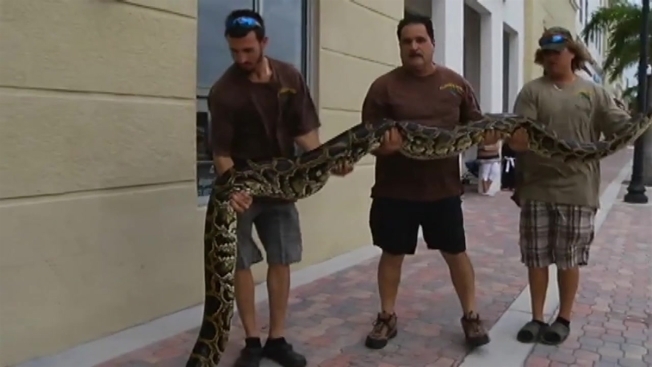 A 14-foot long Python was found in the Everglades Sunday. The giant female snake was shot and killed by a ranger and is now in the hands of Brian Wood, owner of Exotic Love of Fashions. "This is a 14-foot female snake which can produce many offspring," Wood said. "So by taking this one out of the Everglades, it's going to help the environment because we have a big problem with the invasive species with that particular area, so it's very good." Because the snakes have no natural predators, native mammal species in the area are easy prey, researchers say. Wildlife officials are trying to control the python population to save ongoing efforts to restore natural water flow through the Everglades. According to a study released last year, mammal sightings in the Everglades are down sharply in areas where pythons are known to live. This one python in particular, said Wood, could have posed a particular risk. "Being that it's 14-feet and as large and healthy as it is, it could produce 60-plus eggs per year," he said.